Born in Mexico City, I came out to the US of A in 1967 to study college ( no I did not swim or sneak across the border) . Got an education in physics and engineering at MIT (this is nothing to be ashamed of). Eventually I settled in Southern California (culture and weather much better suited for Hispanics) where I worked as a Nuclear Engineer (San Onofre Units 2 and 3 ran beautifully for thirty some years with no fossil pollutants released to the atmosphere). I was extremely fortunate to have Kevin Nichols (may he Rest in Peace ) artist extraordinaire, create the illustrations for SONORA PASS. I am a piano player ( jazz and blues aficionado) and enjoy hiking the California eastern sierras (hence the title of my graphic novel) with my wonderful wife Terrie (a 4th generation Californian). Sonora Pass is a graphic novel written by Jaime Olmos and illustrated by Kevin Nichols. Who killed Celia after the Jabberwocky Band reunion -- and why did they do it? Celia and Esteban had made plans to start a new life together in California after he finished an engineering job in Montreal where she had been living. At first, the twenty-year reunion of friends and fellow musicians had been brilliant, but Celia had seen something or someone that had startled her while she was performing. When she was found dead in Esteban’s hotel room, the police had no choice but to presume that Esteban’s flight was an admission of his guilt. Jonah, his friend and fellow Jabberwocky member, was determined to use his skills as a private investigator to find out the truth, wherever it might lead him. Jaime Olmos’ graphic novel, Sonora Pass, is an enthralling sleuth mystery that takes Jonah on a search that goes back twenty years to discover who Celia was and what happened to her. While in graphic novel format, this story is a fully-fledged mystery with compelling, well-developed characters and any number of red herrings for the armchair sleuth to consider. Kevin Nichols’ illustrations are marvelous! Each panel is brightly colored and lushly inked. His skill in portraying facial expressions is masterful, and the amount of work he put into making those characters feel real is impressive indeed. I especially loved his nature art showing Esteban on his bike in the mountains or driving off into the sunset. The scenes depicting Jonah’s visit to Azul in the Huixtlacan Province in Central America are inspired and the railway stations and other architectural drawings are superb. Sonora Pass is an intellectual and visual feast, and it’s most highly recommended. I’m a big fan of comics and graphic novels. By and large, the ones I’ve read told stories about superheroes, were adaptations of classic novels, or retellings of science fiction stories. These are all okay with me. They are some of my favorite tales. Sonora Pass, written by Jaime Olmos and illustrated by Kevin Nichols, doesn’t really fit into any of the aforementioned categories. It is murder, love, infidelity, drug smuggling, friendship, and music thrown into one big package. So, from my point of view, it is a little unconventional for a graphic novel. That didn’t stop me from liking it. Just because I got a lot of my science fiction through graphic novels as a kid doesn’t mean that graphic novels can’t be a powerful medium for more conventional tales. If the artwork is great and the story is good, I think graphic novels can tell any story. Jaime Olmos and Kevin Nichols combine talent and craft to make Sonora Pass a great story. 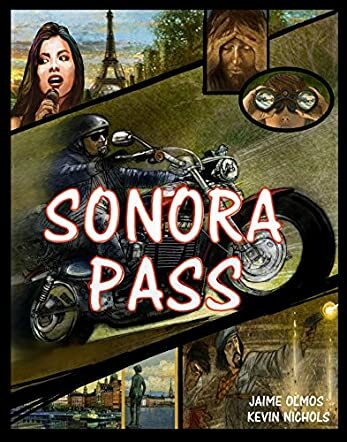 Sonora Pass is one long tale, so you don’t get to know the characters in as leisurely a fashion as you would a superhero title. You have to say a lot and imply a lot with a few words and a few pictures. Not everyone can do it, but Olmos and Nichols pull it off. In a hundred pages we get to explore friendships that are decades old. Olmos and Nichols manage words and pictures like pros, and the result is impressive. I liked the story with its international drug ring implications spanning the North American continent. I liked the art. I thought Kevin Nichols is especially good at portraying faces. All in all, a great read. A rock-Latin fusion band, Jabberwocky, is holding its 25th reunion in Montreal. It is a big event, attracting fans and friends. It’s a wild, crazy party which ends in tragedy when the lead female singer, Celia, is found dead. The band’s saxophonist, Jonah, takes the lead role in the investigation and, as events unfold, he uncovers a trail of the woman’s lost loves and a deeply troubled past that spans from Montreal to Vermont, Southern California and the revolutionary outposts of Central America. It is an intriguing murder mystery tale with a lot to keep readers turning the pages. Jaime Olmos’s graphic /comic book story Sonora Pass is a compelling murder mystery with a lot of action and a dash of humor. The illustrations are sombre, setting the stage for the unfolding events, carried through by dialogue. The author combines his passions and knowledge of music, engineering, crime and geography into a fascinating tale of murder and mayhem. The plot progresses at a good pace, but it’s really the illustrations by Kevin Nichols that carry the story along. They are works of art on their own. The author and the illustrator make a good team and have a lot of intuitive and creative ideas to present. The downside of this novel is that the dialogue bubbles are crammed together and are sometimes difficult to sort through, and it did take a couple of reads before the story started to flow and make sense. The time and geographic changes also hinder the flow of the plot. However, overall, an interesting read.